In this beautifully illustrated picture book, a young girl and her father go owling on a wintry night in the woods. Jane Yolen's story inspires readers to experience the wonders of nature. 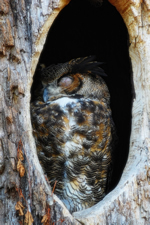 Invite your students to crunch through the snow on a quiet moonlit walk in search of a Great Horned Owl. This book won the Caldecott, an award for extraordinary picture books. What sights and sounds would you see on a winter walk in the woods during the day? What would you see and hear at night? Why do you think the characters in this story decided to go walk in the woods at night? What clues do the title and cover illustration reveal? What animals do you notice as the story unfolds? What sounds could you hear in your imagination? What outdoor adventures have you enjoyed? Do you think she goes owling? Where do you think she lives? What do you think she hoped readers would say after reading her book? Collect descriptive phrases Jane Yolen used to help readers paint pictures in their mind. What similes and metaphors are in the story? What words and phrases give sensory details? How did the author create a quiet tone for the story? What techniques did she use to make it sound like a poem? 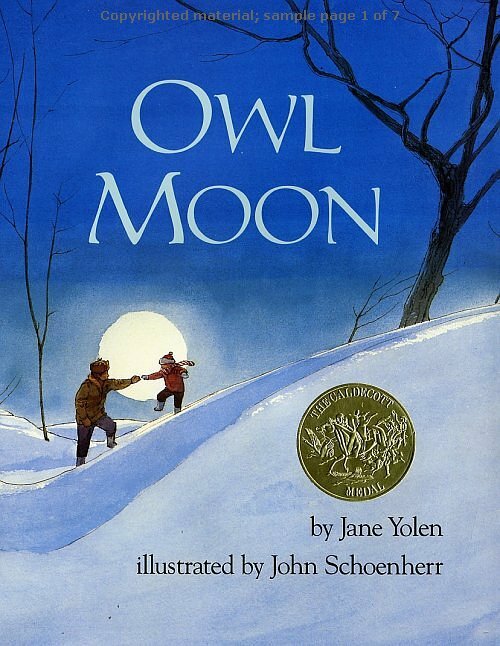 Share biographical information about the author and illustrator with students: Yolen was inspired to write Owl Moon because her husband often took their children owling in the woods near their farm in Hatfield, Massachusetts. Her husband, a birdwatcher in real life, is portrayed as Pa in the story. The young girl in the book is based on her daughter, Heidi, who is now an adult with her own daughters, Glendon and Maddison. The illustrator, John Schoenherr, lives on a farm in New Jersey. Owl Moon describes the sounds to listen for when you go owling. Owls have a wide variety of vocalizations. Jane Yolen lives in rural Massachusetts. What kind of owl would she see on a walk in the woods? John Schoenherr lives on a farm in New Jersey. What kind of owl would he see on a walk in the woods? Why did the characters go owling at night? 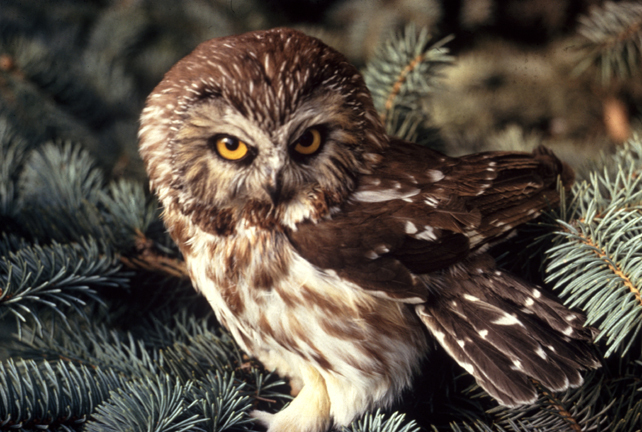 Research different kinds of owls to find the facts about owls and their habitats. In Owl Moon, the characters walked through the wintry woods with woolen hats, scarves, and mittens to protect them from the cold. 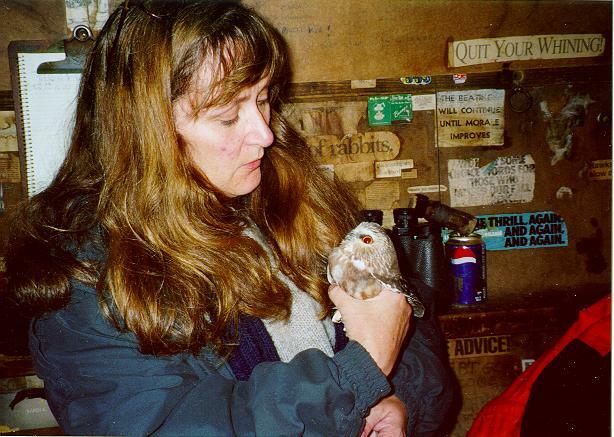 What physical and/or behavioral adaptations help owls survive subzero temperatures? The author wrote, "...the owl pumped its great wings and lifted off the branch like a shadow without sound." She also wrote, "...flies on silent wings?" Research facts about how owls fly to answer the following questions: Why did the author describe an owl's flight as silent? Why would owls need to fly on "silent wings?" Imagine a Great Horned Owl perched high on a tree branch during a frigid moonlit night. Write the events of Jane Yolen's story from the owl's point of view. What sounds would the owl hear? How will you describe the owl when he hears the family crunching through the snow? Owl Moon is a fictional story. What kinds of facts would readers want to know after reading the book? Imagine that the publishers wanted to include a fact page about owls at the end of the book. They have hired you to write a fun facts page to help readers learn more about owls. In Owl Moon the story is written from a young girl's point of view. Imagine that the little girl snuggled into bed after her wintry walk in the woods. Before going to sleep, she writes about her adventure in a journal. Write the diary entry the young girl may have written after her night of owling. Create an invitation that would inspire families to plan an owling adventure. How will you persuade kids to turn off their television sets and video games to take a quiet tour through the woods?